On FRIDAY - JUNE 30, 2017, 6:30 PM - 9:30 PM; the Brewers & Blues Against Hunger Tour is going to be in Medford, Oregon at Walkabout Brewing Company. 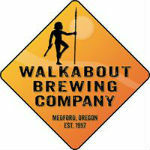 Walkabout Brewing Company was established in 1997 in Central Point, Oregon by founder and head brewer, Ross Litton. A native of Perth, Australia, Ross has been a resident of Oregon for 21 years. Walkabout brews have traditionally been available primarily in Southern Oregon, however, distribution has now been expanded to include Portland, Salem, Eugene, and Corvallis.